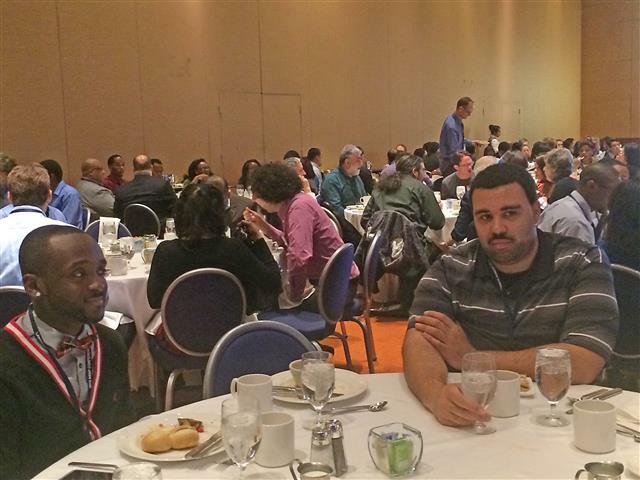 Physics faculty member Dr. Dan Smith accompanied seven SC State students to the 2015 National Society of Black Physicists meeting in Baltimore, Maryland, on February 25-28, 2015 (link). Student attendees from SC State included Matthew Aleruchi, Martin Brown, Johnae Eleby, Malquan Gaillard, Satyam Giri, Myles McKay , and Badal Poudel. Myles McKay, a SC State junior majoring in physics with the astronomy option, gave two oral presentations at the conference. 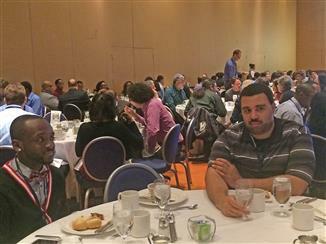 His talk entitled “My National Astronomy Consortium (NAC) Experience” discussed his internship with the NAC at the National Astronomy Observatory during the summer of 2015. 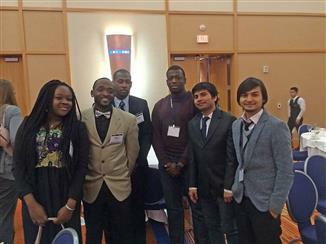 SC State Students (right to left ) Badal Poudel, Satyam Giri, Myles McKay, Malquan Gaillard, Martin Brown and an unidentified female student from another school.